HAPPY NAVRATHRI TO ALL MY BUDDY BLOGGERS!!! Hope you guys are having fun with all those wonderul dolls. Kolu is one of my favorite Indian festival where we get to see lots and lots of beautiful dolls. 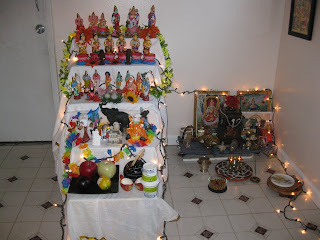 This year I got some help from my girls cleaning up the dolls, setting kolu padi, giving manjal kumkumam to friends etc. Since I had to go get thamboolam from my friend's place, I am doing sundal & sweet on every other day and the remaining days, I just use white rice for neivedhyam. 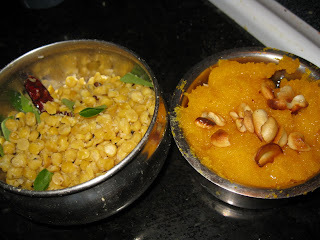 Yesterday I made Kadala paruppu sundal & Rava Kesari for neivedhyam. 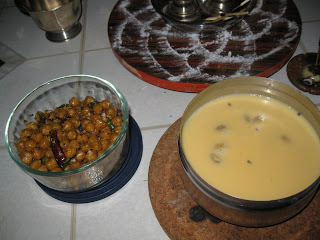 On sunday I made Garbanzo sundal and aval Payasam. 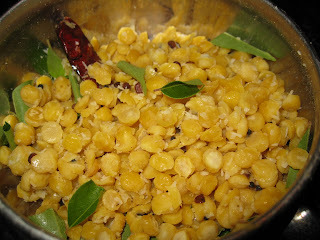 I am sharing the recipes of kadala paruppu sundal and rice flakes payasam here cos I have already posted the recipe for rava kesari and Channa sundal. Soak dhall for an hour. Pressure cook it upto one whistle. Dhall should not be over cooked. Other wise it will be mushy. Once the pressure is released, drain the dhall and keep it aside. Take a pan, pre heat oil, splutter mustard seeds, fry urad dhall and red chillies to golden brown. Now add the cooked dhall to it and mix it well.Add salt and asafoetida powder and mix it. Turn off the stove and sprinkle the coconut and garnish it with curry leaves. 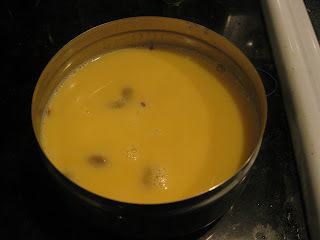 This is the first time I am trying this payasam and I found it very easy and handy. Here goes the recipe. Soak rice flakes in water for half an hour. Drain it fully and keep it aside. Now take a thick bottomed pan and pour a cup of milk and bring it to boil. When the milk starts boiling, add the aval to it and let it boil for 3 minutes. Now add the remaining mil, cardamom, food color and pachakarpooram and let it boil for another 5 minutes. When the quantity becomes 3/4th turn off the stove and add the sugar at the end and mix it well. Fry cashew to golden brown in ghee and pour it on top of payasam. It just took 10 minutes to finish this payasam. Just wanted to know if you are also having a problem with Followers widget not showing up??? Great to catch someone with my name. Such a lovely golu vidhya, delicious neivedyams, everything looks delicious !! yummy recipes! Do checkout my blog when you have a chane. I would love to get your feedback.. Happy Navrathri to you too. Very nicely done golu.Neivedhyams are befitting the festival season.Veetla, kuzhandaigal irundhaalae thani interest illa? Happy Dussehra to you and your Family.